Across various human cultures, lions have been depicted as the king of all animals, due to their large manes and beautiful appearances. Whenever there's a lion in a fictional work, it usually may be a figure of authority or royalty. Likewise, if the lion is part of a group of heroes, it can play the role either of The Hero or The Leader. Similarly, fire has been seen as an important symbol in human cultures since ancient times. Being a symbol of warmth, light, protection, and even creation. It's common to see fire along with other elements as part of a Four-Element Ensemble. So naturally, many artists, writers, and other media creators would put the two together to create a fiery lion, possibly due to the reasons stated above. It may also be due to the fascinating manes of lions, which can look like cartoonish depictions of fire. This trope is Older Than Steam with the alchemical image of a lion eating the sun. Can be part of Burning with Anger. See also Hot Wings, Flaming Hair, and Panthera Awesome. The Brave Express Might Gaine: Lio Bomber is based on a lion, and his special attack, Lio Fire, have him breathe fire. Black Clover has the Crimson Lion Kings. They are a Magic Knight Squad with the sigil of a lion, and most of their members use a form of Flame Magic. Cardcaptor Sakura: Kerebos is a lionish being, which is connected to the Sun, and so, to the element of fire. Magic Knight Rayearth: Rune God Rayearth governs fire magic while taking form of a lion-wolf hybrid. One of its most distinguishing features is that his mane is made out of fire. Katekyō Hitman Reborn! : Box Animals are animal surrounded by and able to generate flames. This includes Tsuna's Natsu — a lion cub — and Xanxus's liger (a lion/tiger mix). One Piece: Holdem, a Mook Lieutenant of the Beasts Pirates, has a living lion head on his stomach that is capable of breathing fire. In Saint Seiya Omega, Soma is the wielder of the Lionet Cloth and his fire-element Cosmo, producing flames with his attacks. Harry Potter: As per Word of God, the four houses of Hogwarts form a Four-Element Ensemble, with corresponding colors and animal mascots. Gryffindor, with its red color and lion mascot, corresponds with fire. Warrior Cats: Firestar, an orange cat who was prophesied to be the "fire" that would save Thunder Clan, receives a sign from the his warrior ancestors in which his reflection is replaced with that of a lion with a mane that is described as "blazing". Kamen Rider OOO: The Lion medal grants OOO a maned helmet which can produce bright light to blind enemies. The Set Bonus of the Lion-Tiger-Cheetah combo upgrades this to a deadly aura of searing heat (which also transforms the Tiger medal's claws into hot blades). Super Sentai and Power Rangers use lions and fire for many of their red rangers. GingaLeon, the Lion Galactabeast, and their associated rangers are able to attack with fire. GaoRed and Red Lion Ranger are known as the Blazing Lion. Shishi Origami and Lion FoldingZord's element is fire. Castlevania: Chronicles of Sorrow: The demon Baur is a lion head on a flaming wheel. The lion in Crusader of Centy has a fireball attack. Leomon has an attack called "Fist of the Beast King", which is basically punching (instead of throwing) a fireball shaped like a lion's head. See fanart of this here . Firamon is a winged lion with fire constantly pouring from the mechanical implants on its head, legs and tail. All of its attacks involve fire in some way — Flame Dive has it charge from the sky while Wreathed in Flames, Fira Claw is exactly what it sounds like and Fira Bomb lobs a burning projectile at its target. The Legend of Zelda: Lynels are recurring lion-centaur enemies who are capable of breathing fireballs. In Kingdom Hearts III, the King's Flare Link Summon allows Sora to summon into battle a fiery-looking Simba, who can pounce on enemies with Firaga Leap, as well as let out Firaga Roar. The Kirby franchise has a recurring miniboss simply called Fire Lion, a brown lion with a mane of fire. It uses a combination of Natural Weapons and fire attacks. Mega Man ZX: Fistleo, one of the bosses, is a lion-man robot with fire powers that he gets from the Biometal Model F inside his body. He's a Blood Knight who loves to test his powers against strong opponents. Monster Hunter: The Elder Dragon Teostra and its mate Lunastra are large, winged lions with fiery manes and fire as their primary element. In Persona 2 Innocent Sin, this trope is used liberally through association of the zodiac sign Leo with fire. The Hero Tatsuya Suou has the zodiac sign of Leo, a lion design on his belt buckle and his Personae are specialized on the fire element. In addition, his Ultimate Persona is Apollo, which is also associated with lions. His Foil Tatsuya Sudou is called "King Leo" In-Universe and also has fire abilities. He's also an Ax-Crazy arsonist. The "Leo Mask" type enemies can only use fire magic. The Leo Temple is a Lethal Lava Land which hosts the Crystal Skull of Fire. Entei, a Fire-type legendary and part of the legendary beast trio, is partly based off of a Chinese guardian lion. Pyroar is Fire/Normal type Pokémon resembling a lion with a flame-colored mane, with the male's mane even being shaped like the sun. A Pyroar serves as one of the main Pokémon of Lysandre, the Big Bad of Pokémon X and Y, who is associated with fire and heat. Solgaleo is a Steel and Psychic-type legendary Pokémon resembling an enormous white lion, but is heavily associated with the radiance and heat of the sun. It's based off the alchemical image of a lion eating the sun. Ironically, being part-Steel type makes it weak against Fire-type attacks. Rivals of Aether has Zetterburn, the lion prince of the Fire Nation who wields fire and has a burning mane. Fire Leo from Viewtiful Joe is a high ranking lion-man member of JADOW and a late-game boss. He's usually Wreathed in Flames and Joe cannot hit him directly, unless Joe uses the technique that gives him an even hotter fire (the Mach Speed) in order to bypass it. Inverted with Frost Tiger from the second game, apparently being Fire Leo's brother. Virtue's Last Reward has an anagram alluding to the lion eating the sun. 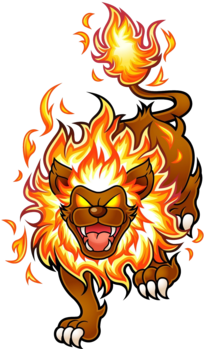 Yo-Kai Watch: Blazion is a fire-attribute lion yokai with a flaming mane. When inspiriting someone, he makes them "fired up" and determined. In The Lion Guard, the evil lion Scar is brought back from the dead, manifesting himself as a giant, flaming head in a volcano.